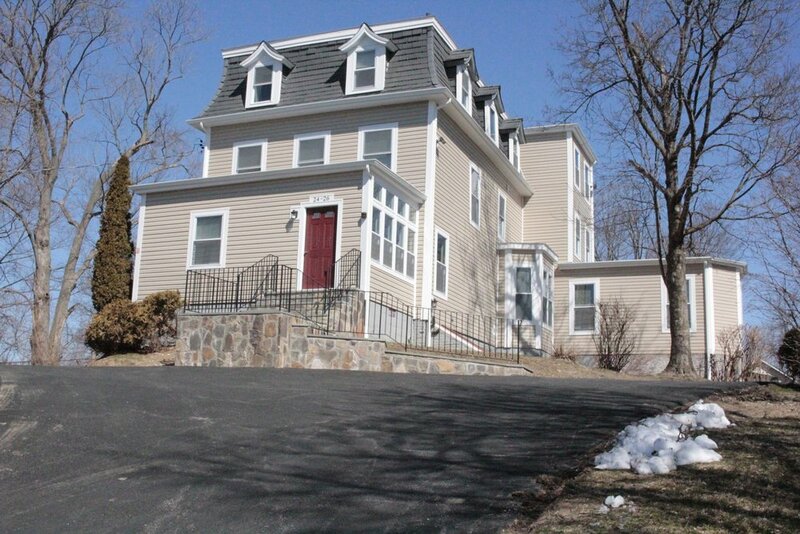 235 Spring Street, Ossining NY: This four unit Mansard roof Victorian offers one studio and three two bedroom apartments. IFCA Housing Network consists of 14 street addresses. Thirteen of them are in the Village of Ossining and one is in Tarrytown New York. We offer a wide range of accommodations ranging from apartment buildings to quaint Victorian multifamily homes. Each property is unique, as the majority are an average of 90 years old. Much care has been taken to preserve as much of the original charm of these gracious old structures, while ensuring they conform to current health and safety codes. IFCA provides studios, one bedrooms, two bedroom and three bedroom apartments. This multifamily home is located a few doors down from IFCA's main offices on Spring Street and has a two bedroom apartment on each of its three stories. Through IFCA's Defensible Space for Children Program, a security fence was installed in the backyard to safeguard young children living at this property, allowing them to play in the yard without fear of street traffic, trespassers or stray dogs. This lovely attached property, is home to six apartments. Located conveniently across the street from Ossining's Park Early Education Center for children in pre-school and kindergarten and within walking distance to two neighborhood parks, 13-15 Edward Street is a perfect location for young families. Six families call 19 Hamilton Avenue home. This stately Victorian is located on a quiet Village street with views of the Hudson River. It offers free off-street parking, a lovely yard and is in close proximity to parks, shopping and public transportation. This impressive brick building at 40 James Street was formerly owned by the former King's College and used as housing for faculty and staff. Today it is home to twelve families. It offers free off-street parking and is within walking distance to shopping and public transportation. The charming brick structure at 273 Spring Street was the former nurses' quarters for the now closed Ossining Hospital. It is IFCA's largest property with seventeen, one-bedroom units. It offers a lovely shaded yard, perfect for picnics and summer BBQs and it is within walking distance to several of Ossining's Town and Village parks. 14-16 Broad Avenue, houses five apartments and is located close to shopping and public transportation. IFCA's offices are located on the ground floor along with IFCA's Spring Street Exchange Thrift Shop, for convenience. 24-26 Ann Street is a recently renovated Victorian-era building that houses eight apartments. Located near the Ossining Recreation Center, public transportation, and shopping, this property provides convenience without losing its historical charm. Private parking is included. Another of IFCA's beautiful multifamily homes, 53-55 Hunter is home to five apartments. Located on a lovely quiet, tree-lined street, close to the Hudson River, shopping and public transportation, this property is the ideal restful retreat. purchased in 1972. Newly renovated in 2015, IFCA installed modern conveniences while taking great care to preserve the historic charm and curb appeal of this home. This four unit building is conveniently located within walking distance to schools, parks and public transportation. Another of IFCA's beautiful multifamily homes, 22 Wildey Street has six apartments, off-street parking and central air conditioning. It is located in the heart of Tarrytown, within walking distance to shopping, public transportation, schools, library and parks, making it truly ideal for singles and families alike. Another of IFCA's beautiful multifamily homes, 223-225 Spring Street is a newly rehabilitated building housing six apartments. The property boast a spacious fenced-in yard and off-street parking. It is centrally located, within walking distance to shops, transportation, schools, parks and more.